While cleaning tonight I found this little guy sitting in my flowerpot. At first I was so shocked to see such a huge spider in my living room! But, he had such a nice expression and was so Zen-like, that I just knew that he was the sort of guy who wouldn’t ‘hurt a fly’. I hope he decides to ‘hang’ around for a while…. A characteristic of most amigurumi (from what I’ve gathered from Japanese craft books) is that the head is larger than the body, which gives them a sort of anime-character look. 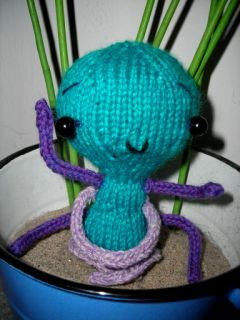 Generally when adding a body to this type of toy, the stitches on the head are cast-off when there are 12 sts remaining (and the tail is not threaded through the remaining stitches and tightened). When the body stitches are cast off, there should be the same number of stitches as the head. There are so many different variations of body-types, but in this tutorial, I’ll describe how to create 4 main ones. Each one is based on one basic type and then ‘tweaked’ to give different shapes. 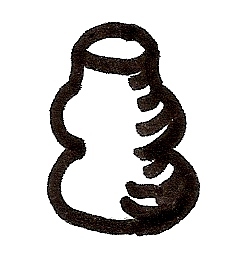 The round type is similar to the earlier crochet/knit dolls of yore. 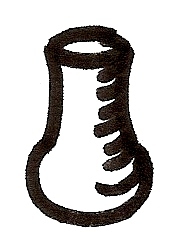 It is basically a round shape that (if updated to be more contemporary) is slightly smaller than the head. 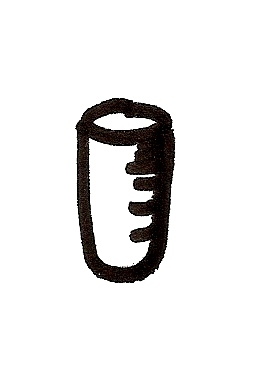 Making a cylinder is the most simple of all the shapes. 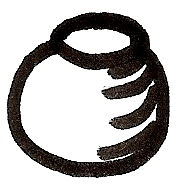 It is simply one or two increases knit in the round until the desired length is reached. If greater width is preferred, follow head pattern until the desired number of stitches is reached and then k every rnd until end. Note: Make certain that the number of sts that are BO are the same as the BO number of head sts. Stuff head with cotton batting or poly-fil. Mattress stitch head to body matching head sts with body sts (whip-stitch will work, but your creature might look a little Frankenstein-ish..). Tuck in ends. 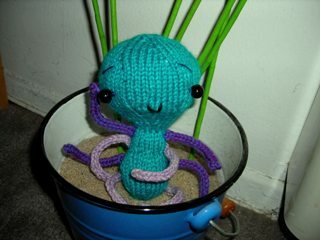 add i-cord or felt arms and legs..
make (4) 6-st cylinders for arms and legs..
…to make your own amigurumi creation. That’s pretty much it! With these basic shapes, there are endless possibilities, so I hope you let your imagination run wild! Have fun and feel free to post a link with your creations! Very interesting, thanks for sharing! And you’re correct, ideas are endless! Glad you found it helpful =) Let me know what you wind up creating! So much so that I’ve included a link in my newsletter! Hope you don’t mind, email me if you’d like a copy! Wow, what an awesome tutorial!! Thanks! I just used the head plus the vase-shaped body to make a kitten. Very useful! Thanks for this post! So glad you could use this tutorial, Alyssa! That’s great — I’d love to see a picture!